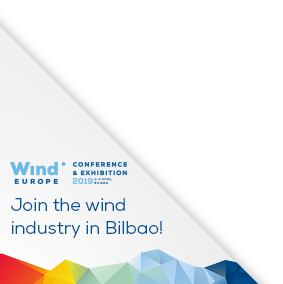 We’re gearing up for our major event of the year: the annual WindEurope Conference and Exhibition in Bilbao on 2-4 April. The event covers both onshore and offshore wind. Registrations are now open and as a WindEurope member you get a 30% discount. It’ll be a great event. We couldn’t have chosen a better venue, given the buoyant state of the Spanish market right now, the expansion of the industry there (9,000 new jobs this year and next) and the key role Bilbao and the surrounding region play in that. There’ll be Ministers for 5 different countries there. And a dinner in the Guggenheim. Top policy makers and industry leaders on how to work together to deliver the transition and the huge increase in wind power it entails. And how to ensure all of Europe’s citizens benefit from the transition. The Spanish and Portuguese Energy Ministers are both coming, as is Michal Kurtyka, the Polish Minister who chaired the last UN climate talks in Katowice. We also have Ministers from Croatia and Norway. We’ll look at the emerging transformation of Europe’s grids and energy system and markets to integrate the rising penetration of renewables. Wind energy provides the affordable and reliable power people want. We’ll look at how wind benefits local communities, at the people who work in our industry, and the challenges around manpower, skills and qualifications. And at the local and broader political support for the continued expansion of wind. On 1 April, the day before the event starts, we will be hosting a roundtable on zero-subsidy bids with the European University Institute. Also on 1 April we have our annual Members’ Reception, hosted this year by Iberdrola at the top of the iconic Iberdrola Tower. On 2 April there’ll be a Gala Dinner in the Guggenheim Museum. There are still some spaces left on the exhibition floor, so do let us know if you want to take part. The Bilbao event comes 7 weeks before the European Parliament elections. We will use the opportunity to communicate how instrumental the EU has been in driving the growth of renewables, the key role that the European Parliament has played in that – and how society has benefitted as a result. The underlying message will be how important it is that people go out and vote in the elections in May. The EU’s big policy challenge right now on renewables are the 28 National Energy and Climate Plans (NECPs) for 2030 that have to be finalised this year. Most countries have now sent their first drafts to the EU Commission. They are very thin on policy detail. Especially on planning for renewables that reach end-of-life before 2030, on measures to push electrification and on the removal of existing barriers to the expansion of renewables. Fortunately the Commission is determined to push for improvement in the Plans over the coming months. They’ve had a first closed door meeting on them with national Governments and will send formal responses to each Government in April. We are feeding into the Commission recommendations of key points to pursue for each of the 28 parallel negotiations they’ll be having with national capitals. use the Plans to remove barriers in their existing laws to further the expansion of renewables (current barriers to corporate PPAs, for example). Finally, it’s that time of year where we publish statistics for wind energy in Europe in 2018: new installations; new investments; and the share of wind in the power mix. Last week we released the offshore data: “Offshore Wind in Europe: Key trends and statistics 2018”. 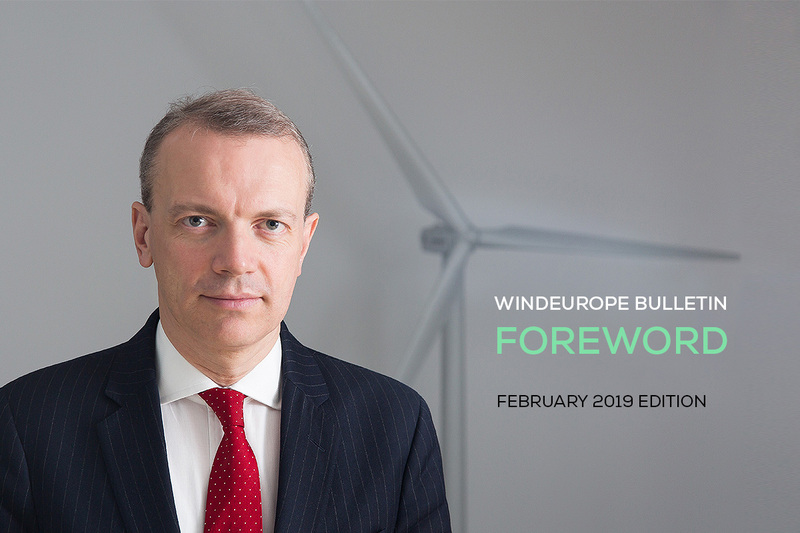 Headlines: 2.6 GW new installations; €11bn new investments announcements (covering another 4.2 GW); and offshore wind is now 2% of Europe’s power. We will publish the combined onshore and offshore stats on 21 February and will do a webinar on them on 26 February. You can register for that here – it’s free. That’s all for now. Do remember to register for Bilbao!